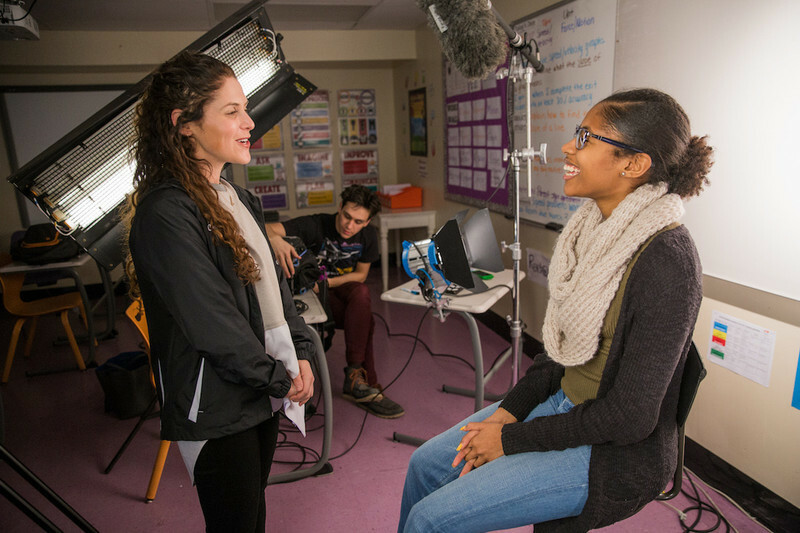 Cameras rolled for years inside the gymnasium and classrooms of Baltimore Leadership School for Young Women, as guided by the direction of up-and-coming producer/director Amanda Lipitz. The focus was two-fold, that of following a high school dance step team (named the Lethal Ladies) practice and compete with routines inspired by the likes of the Black Lives Matter movement, and also that of their grades. In particular, Lipitz’s film "Step" is the story of three step team members/students (Blessin Giraldo, Cori Grainger, Tayla Solomon) as they work hard at their studies just as much as their dance moves. They have incredible mentors in the likes of the unforgettable step leader Coach G and Paula Dofat, the Director of College Counseling. “Step” is a film in which the Lethal Ladies’ thunderous routines matches the raw intensity of watching these women overcome various life obstacles, inside and outside of school, in order to graduate. RogerEbert.com spoke with Lipitz about her new film, her long history with the women of BLSYW, presenting an image of young black women that is extremely rare on the big screen and more. What were your dreams for this project when you started making it? Did you think it would receive the reception that it has so far? I never made this film thinking any of this would happen. I didn’t make it for Sundance, I didn’t make it for Fox Searchlight, I made it for the young women in it. And I always had that in mind because I just wanted them to have been proud to have been a part of it and glad that they trusted me with their stories. Because I felt it was a great privilege, I still believe it was a great privilege. Having anyone, besides the 19 young women that made it, see it and be moved by it, is just the most unbelievable thing. Was showing the movie to everyone from the Baltimore Leadership School for Young Women the most petrifying screening you’ve had so far? It was petrifying. We planned it out and decided that we would not show it until they got to Sundance. So I did call every single young woman and their mother, with Coach G prior to Sundance and we said, “This film is about a team, which is why you’re coming to Sundance. But we do want to let you know that are primarily following the college paths of Blessin, Cori and Tayla. And we hope that you can still come and be a part of it. Because they are teenage girls and you want everyone to feel good about this path and journey they have gone down. And so we did comp everybody ahead of time, so it wasn’t this big shock. And that included Blessin, Cori and Tayla. and then we got a very small screening room and it was the 19 girls, myself, the principal, a couple of the moms that were there, a couple of the teachers, Coach G and Paula, they had waited to see it until they were in the room with the girls, they also said they did not want to see it prior. And I was ready, and afterward the head of the school stood up and she said, “Do you have any questions for Amanda?” One of the young women was sitting down in her seat, she was in tears, and I said, “What did you think?” and she said “It’s the best movie I’ve ever seen!” And I was like, do you have any questions? Ask me anything. And they said, “Can we see our music video?” Because they had made a music video that wasn’t in the movie. Do you remember some of their reactions? The step sequences certainly achieve that, with their inherent energy, the sound, and how you film them. I really thought of it as a musical. When I first saw them stepping, for me it was like a musical. It’s what happens in a great musical, characters can’t speak any more in a musical so they have to sing. That’s what these young women were doing with step, they had to step to get it out. And for me, the stomps, the beats, the claps, that was the music and what they had to say was the lyrics. And the melody, the reoccurring melodies was the Lethal Ladies chant, was their theme songs. And I also was really inspired by “Hoop Dreams” I was rally inspired by “Fame,” by “Rocky” the pyramid montage. I studied these montages. Every great montage has this through line, the thing that gets you through. So I knew that there needed to be this montage of them getting better, and like improving becuase they did. And I just was like, what was the thing that they worked on and worked on and they couldn’t figure it out. And I was like, the pyramid. It’s the pyramid. I also, working with Laura Karpman and Raphael Saadiq on that, I was like, it needs to be not hip-hop, not R&B, not pop, it needs to be a “Rocky” theme, we need to have Blessin’s theme, that that was the theme. That was a huge inspiration, “Reservoir Dogs” the walk down the hall, “The Hangover,” that was also the only part of the film that was staged. I actually showed them those moments from those movies, and I was like, “These are always white guys. So we’re gonna flip this on its head.” So I’m really inspired by music, I read a lot that Quentin Tarantino always starts with his soundtrack before he writes his scripts. And so for me that’s really where I come from, but I also was really lucky to have these young women who are obsessed with music. So they’re playing music all of the time and I was taking these mental notes and playing them in my head. I always knew that was, I was like, “Gosh, this song is about Baltimore, and it’s amazing!” And so for me, it was constantly being inspired by that and what they were thinking and what they talking about, and using their lives. And while I was learning about their lives and going even deeper into their lives, to inspire different moments. I’m curious as to the timeframe of that, and the footage you shot. Well, I have known them since they were 11 years old. I have been making shorts in their school, I would go in five or six times a year with cameras. I made two dozen shorts, maybe more about first-generation students going to college and girls’ education. But everyone would say, “You should make a documentary, but it’s like, what’s the hook, what’s the thing? The Broadway producer in me was like [in a nasally voice] “What’s the hook? What’s the thing that’s going to make it different than every other story of ‘kid gets out, goes to college’?” Or, “championship game” or some kind of sports analogy. I really wanted to know the hook for it all. So, I never felt compelled to make a documentary until I saw them stepping. I saw that when they were in the eighth grade, because Blessin asked to come film them when I came to school with cameras. What kind of preparation did you have to do, to be ready for both filming their lives and their step routines? It reminded me of the scene in “Finding Nemo,” I’m also very inspired by animated films, because they’re musicals. But you know the scene in “Finding Nemo” where the fish get trapped in the net in the end, and they say, ‘Swim down, swim down! If we all swim down, we’ll break free!’’” That’s literally what I was thinking of in that moment, because that’s what it felt like. We’re all in this net, we’ve got to swim down, we’ll break free, but we all have to do it together. And I was so inspired and I was thinking of cutting a trailer, and then Freddie Gray was killed and I watched my hometown burn on national television, and I didn’t like what the world was saying about Baltimore. I knew about this pocket of hope and joy embodied by these young women and their teachers. So I raced to put my footage into a three-minute trailer. I showed that trailer to two people, Scott Rudin and Steven Cantor, they both signed on and said, “We love it, keep going.” I spent my summer getting permission from the Baltimore school system, I had more meetings with parents and teachers. They didn’t have a step coach and I was like, “You have to find a step coach.” They found a new step coach and I met Coach G the day she walked in, and she said she lived on the street Freddie Gray was killed and I said, “Please tell them that.” And so, it has all been this “meant to be” kind of thing. Paula Dofat, I met doing a different short in New York with the young women’s leadership schools, and I was so blown away by her. And then she told me had to move to Baltimore! And I was like, “You have to more to Baltimore? I know a school that needs a college counselor!” The girls were just starting ninth grade and looking for their college counselor. So, everything that has happened with this movie has been meant to be. What about with their senior year? How did that come together for you and the production? Senior year we hit the ground running, and I knew that it would be senior year, because senior year is so fraught with so many milestones. And for me as a storyteller, in theater and TV, whatever it is, you need to have a moment. You have to have a beginning, middle and end, even if you don’t know what’s going to happen between that beginning, middle and end. I knew that first scene was going to be graduation and my first day was going to be Founder’s Day, when they’re walking down the streets of Baltimore and the riot footage, the uprising of these young people. I had 400+ hours of footage that my amazing editor, Penelope Falk, whittled down to 83 minutes—I don’t believe that anything should be over 93 minutes. And she’s done a million amazing movies, like the Joan Rivers movie, she’s incredible. And she was a seasoned pro and I was a first-time director, so she made me sit with her for eight hours, to show her the footage I had that I thought were scenes. Eight hours later, she signed on. I’m super grateful to her. 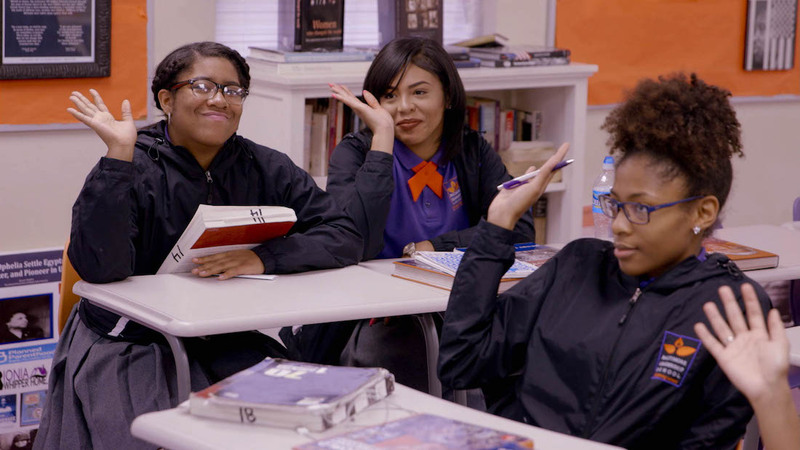 The movie offers a rare focal point of women of color pursuing education as the main goal. It's an extremely rare image. There’s nothing like “Step” in the current movie world. It’s so funny, when I read somebody say that this was “ground-breaking,” I said, “Whoa, I never looked at it like that.” Because this is how I see them, and this is how I see all young women. I have been to hundreds of the worst schools in this country, and every time I meet these young people ... this is my view of them. But this is who they really are. For me, it moves my heart when people say, especially when young black women say to me, “I finally saw myself. Thank you for showing myself.” I’m very honored, but it also makes me so sad! Because I’m like, “What the hell have we been doing all of this time?” And I think there’s also lots of other communities that have been kind of put in this box in the entertainment industry and have only been allowed to be seen a certain way. I hope that through “Step” that maybe other people look at things a different way, maybe people will look at young black women a different way. And their mothers. To read our interview with the film subjects of "Step," click here. Next Article: To Know Us is to Love Us: Interviews with the Real-Life Wonder Women of "Step" Previous Article: This is Not a Political Issue: Bonni Cohen and Jon Shenk on "An Inconvenient Sequel"